Good Afternoon all, it’s Liza the Owner of The Wandering Path. The holiday’s are upon us and I know myself as well as many others may feel disconnected from people…that while we love them…we don’t seem to know them anymore. Relationships…need to be tended. Some connections can come back quickly while others take more effort. Then you have the ones where you realize that your time together has passed but that doesn’t mean you can’t become friends again but in another way; to learn again about what the journey has been like; how you can be that support for one another; have respect for one another; or bid them farewell and wish them the best of luck in their journey ahead. Life is a journey we all take; and those that travel with us will change; but it is on us to make sure that those we want along our journey stay with us for they may find another path and fade away before we even know it. Brightest of Blessings to you all. Good Morning all, it’s Liza, the Owner of The Wandering Path. An editor friend of mine, Carole, saw this in the wee hours of the morning and thought of me. I thought I would share it with all of you. I know I actually would choose to walk through many of the doors as depending upon the day and situation as I would prefer some over the others. I hope you enjoy it and it works for you as well. BB! Back to my tax preparation paper building (oi vay). –Liza M.
If you chose Number 1, Your Path is Freeing. You are the type of person who needs a ton of space. You need the freedom to do things your own way. You prefer the path that you carve yourself, especially one with infinite possibilities and routes. You don’t want to feel constrained. You are highly independent and even rebellious, but you don’t like confrontation. You’re more likely to passively resist someone or something. 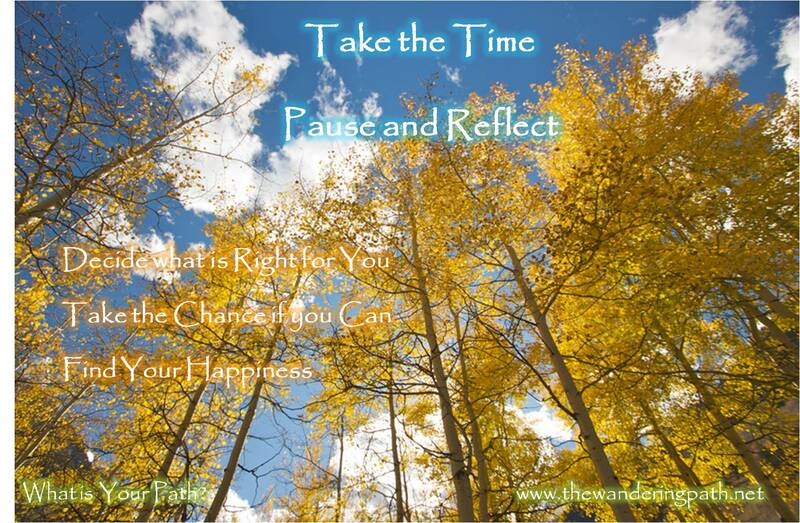 You hate to be rushed, and you prefer to take the time to savor life. You’re too busy enjoying life to draw attention to yourself. If you chose Number 2, your path is Private. You are the kind of person who prefers to travel alone. You like to observe, think, and sort out whatever is in your head. You prefer a path that’s fit for one. You can see others once you arrive at your destination, but you need your downtime first. You are very original and insightful. You look at the world in a unique way, and others can benefit from your point of view. You are a bit of a loner, but you connect well with people when you take the time. You are very understanding. If you chose Number 3, Your Path is Colorful. You are a very engaging and engaged person. You love to be a part of the world…you like to experience it all. Your ideal path is filled with color, excitement, and beauty. For you, it’s more about the journey than the destination. You are curious and excited to learn more. You love to start conversations, and you ask lots of questions. You are intellectual and witty. You think of more zingers than you’d ever use, and you keep people laughing. If you chose Number 4, Your Path is Exciting! You are always moving forward in your life, often into the unknown. You just go for it and deal with the consequences later. Your ideal path is unpredictable and maybe even a little scary. You are drawn to the unknown. You can be a rule breaker, and you’re even somewhat careless. You have been known to act without thinking, but it usually works out for you. You are very spontaneous and a major thrill seeker. You are going to make the most of the time you’ve been given on this planet! 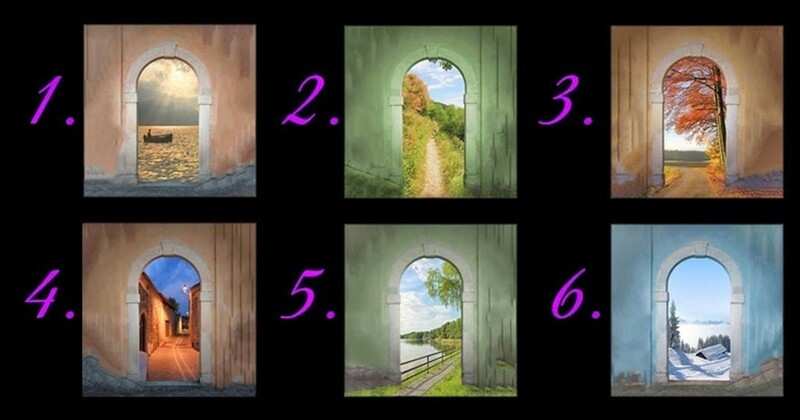 If you chose Number 5, Your Path is Welcoming. You are a peace-seeking, low maintenance person. You are very content, and you don’t like to be bothered. Your ideal path is clear cut and enjoyable. You want to enjoy your trip and to know what you’re getting into. You will often take the easy choice whenever possible. Life is hard enough, and you never want to make it harder on yourself. You are stable and supportive of those around you. You are known for your consistency and down to earth perspective. If you chose Number 6, Your Path is Quiet. You value solitude in all aspects of your life. You can spend large periods of time alone without feeling lonely. Your ideal path is one that is very still and quiet. You want to absorb everything around you without feeling overwhelmed. You seek meaning in every aspect of life. You live very deliberately – both in action and in thought. You don’t like crowds, but you do like people. You value authentic relationships, and you prefer the depth of one on one interaction. Thank you to Little Church Mouse for sharing this thought provoking posting. .
Good Morning everyone. We apologize for being off-line for so long but things have been both busy as well as a bit of a moody atmosphere. The Owner took some time to pause and reflect and she decided to leave her temporary job as the hours it required kept getting longer and her ability to focus on this venture became less and less. Her attitude as well also shifted as the “vibe” at that place also changed with new personnel coming onboard there and no decision to further compensate her for doing “full time” hours. That job was supposed to be part-time so she didn’t expect things like benefits but as the hours kept growing as well as the work load; her discussions with management came to no result so she decided to leave and try to find another position with less of a commute and commitment of her time. She loves the idea of what she’s trying to achieve with The Wandering Path and in the way she wants to do it. She truly does want people to feel better overall and live their lives with smiles as she spent many years where she saw the darkest sides of people as well as saw that happening to herself. Life is meant to be enjoyed not one of a “grit teeth” fest. Blessings to you all and take those chances on things and people that enrich your life. Still another chilly day here in Florida and we are still searching for clear mugs to use that will make it affordable for all to use. We told you yesterday about our dragon embraced crystal pendants. Symbols and representations of what you are seeking or needing can be helpful to many on their various journeys. You can like the style or choose to wear one for its supposed meaning. The belief in the use of crystals or stones is a personal thing and it is entirely up to you whether or not that is for you. 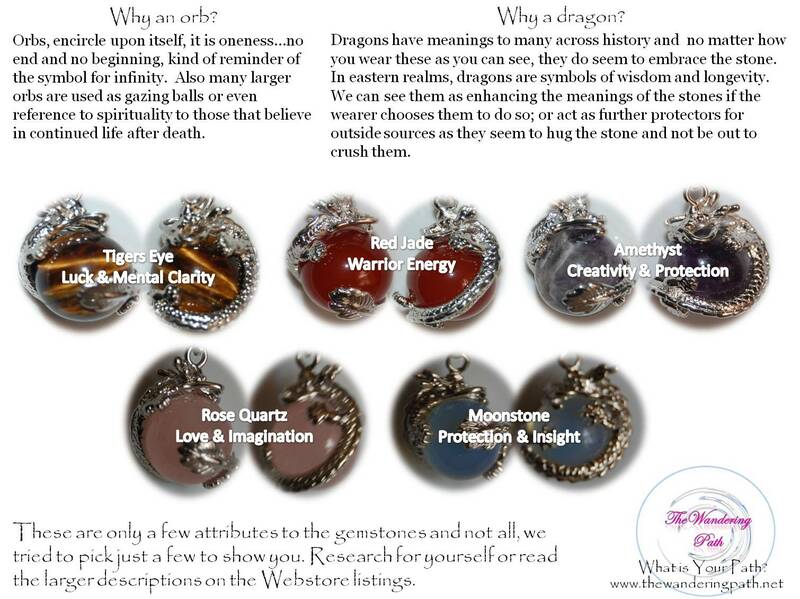 We have prepared a graphic as to why we chose the orb style and the meaning of the stones they embrace. Why you choose to wear one can be entirely up to you. We already find ourselves unconsciously touching and twisting the orbs we chose to wear around here…seeming as if we are trying to tap into the various attributes they hold. Blessings on Your Path! -The Wandering Path Staff.